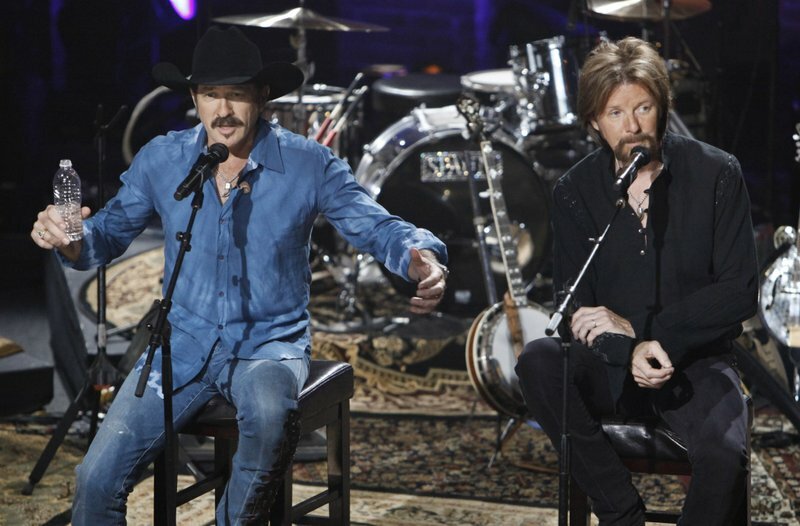 NASHVILLE, Tenn. (AP) — Country superstar duo Brooks & Dunn got back in the studio together for the first time in about a decade to rework their classic songs with the next generation of country stars, including Kacey Musgraves, Kane Brown and Luke Combs. The new covers album called “Reboot,” out on April 5, shows the timelessness of the duo’s catalog of more than 20 No. 1 country hits, which has continued to influence a new generation of country singers. The idea came from noticing that many newer country acts were including covers of Brooks & Dunn hits in their live shows. After their manager suggested a collaborative covers album, Dunn said he thought none of the artists they reached out to would actually want to do it. But he was wrong. After 20 years and more than 20 No. 1 hits, the duo split up in 2010 and they both started working on solo projects. They reunited in 2015 for what’s turned into a four-year residency in Las Vegas with Reba McEntire, but they hadn’t been in the studio together for a decade. But the two Grammy-winning artists said getting back in the studio together felt very natural. Some of their collaborators wanted to stick close to the original recordings, but others like Brothers Osborne and Musgraves came up with new twists on the classics. “It’s good to see these songs that you’ve written or been a part of morph and take on a different place and live through it,” Dunn said. “There’s identifiable licks and whatever in your songs and if you don’t abandon a lot of the core of what was in those original recordings, you can do some fun stuff,” Brooks said. The first two songs to be released from the project are “Brand New Man” with Combs and “Believe” with Brown, with the full track listing to be announced later. The two still perform outside of Las Vegas, mostly at festivals, but their residency with McEntire is the longest-running current country residency in Sin City now that they’ve added more shows in 2019. Many top-tier acts like Lady Gaga, Christina Aguilera and Cardi B are putting down roots at the city’s casinos and theaters this year as well. Dunn said they’ve even gotten to try out some of the new arrangements of the songs during their live shows. “It’s cool to be inspired at this stage of the game by some of the stuff these guys are doing because it rolls right into our wheelhouse,” Dunn said. On this day in history !